A new book argues that public schools are actually academically superior. Summarize what you discovered in your research. CAL: We already know that scores for students in private schools tend to be higher. The question is, is that because they’re from more affluent families…or is that because the schools are doing better? If you go back for a generation the research suggests that there is a private school effect, that even when you control for background factors, private schools seem to be more effective, particularly for certain populations, at boosting their achievement. So what we did, controlling for these background factors, we actually found that the opposite appears to be true and that there is actually a public school effect. Which was a surprise… We were not expecting that at all, but then digging deeper into the data, using multiple data sets, that actually held up. And since that time, other researchers—people at the Educational Testing Service, Notre Dame, and Stanford—have looked at these data sets and come to similar conclusions. Do you agree that public schools are failing? Or is it that private schools are just failing more? CAL: Our data says: If public schools are truly failing, then private schools are in even more trouble. But I’m not convinced that’s the case when you look at a lot of the longitudinal data and even some of the international data. There are reasons to think our typical and our best public schools are doing a pretty great job—it’s just the national averages are often dragged down by the fact that we have a lot of schools with poor-performing students who happen to also be poor. That we have such large socio-economic polarization in this country that students at the bottom are kind of skewing the overall sense of how we are doing. But there are reasons to think that over time, top scores have stabilized or even improved despite the additional challenges that are being pushed on the public schools. STL: I would add that the NAEP data over the past couple of decades have shown remarkable improvement in U.S. students’ scores. So you know yes, public schools have challenges and have problems, but I would say that they really have shown themselves to be effective at implementing new forms of instruction and improving student achievement. And they do that with incredible demands on them to reach such a broad range of students. You suggest that public schools are open to reform and new educational theories in a way that private schools are not. Why do you think that is? STL: It appears that there is a danger in the autonomy that private schools have. The teachers aren’t required to be certified, there is less professional development happening, they’re not held accountable to the same kinds of state curriculum standards and tests. And so when we look at scores on those things it just makes sense that the schools who are hiring teachers who are certified and have been educated in a way that helps them understand all the current educational reforms and the research on learning—that those teachers would be more effective. Particularly more effective at educating students on the state standards...So, yeah, the autonomy of private schools may not be all it’s cracked up to be. Most of the schools in your study are religious schools. What about private schools that serve purely academic purposes? Are they also underperforming? STL: Actually, that was not a category in any of the data that we worked with. There’s this category of “other private” that doesn’t fit into Lutheran, Catholic, conservative Christian, et cetera, but that’s really a catch all-category. A very small sample. So we weren’t able to study that. CAL: And from a policy perspective, that’s less useful because when you look at for example, voucher programs. The largest sector of schools that are accepting vouchers are Catholic, even though Catholic schools have declined a bit in terms of their market share. They are still the biggest player in the private-school sector. Are there situations where it would make sense for a parent to send a child to private school? STL: The biggest reason is religion. It’s understandable that test scores are not the be all and end all for parents. A lot of parents are choosing schools based on religious values and not on boosting the achievement of their children. 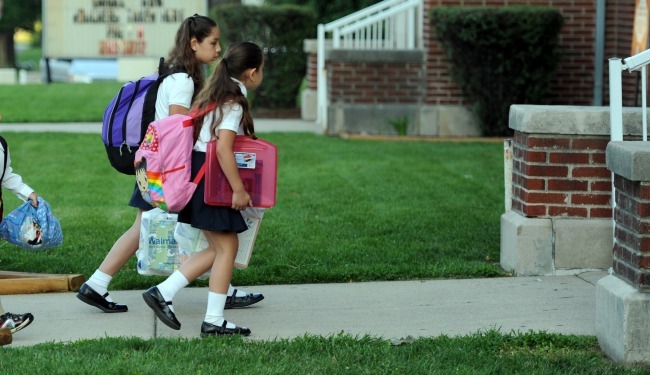 Religion aside, why are parents spending so much money to send their kids to private schools? This is also happening in a context where there is this constant chorus of public schools are failing. Parents are told this by the media and by a lot of reform organizations and so I think that message gets internalized. People just assume that private is better. It appears that might not be true, but nonetheless that’s the assumption that people advance with.